I’m sure most of you are familiar with bellows, through seeing small, often ornate and decorative, sets of them by fireplaces. However the shape that they are today originated comparatively recently, becoming widespread in Europe in the medieval period. Of course the problem is that this required lots of blowers to keep up the air rate, and the air ends up being damper and lower in oxygen because it has been through someone’s lungs. 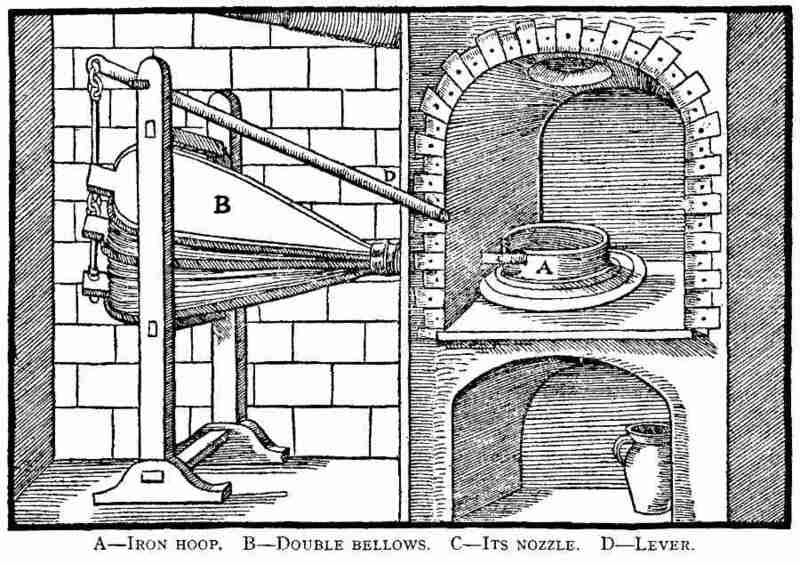 So someone invented bellows, or maybe several people invented them in different places at different times. Archaeologists have spent many backbreaking days operating bag bellows, made out of the skins of animals sewn together with a hole which can be opened and closed by movement of the fingers. At the bottom of the bags are pipes called tuyères sticking out of the bottom, leading into the heart of the furnace. These are usually made of clay and sand or muck of some sort or another, so as to withstand the temperature of the fire, although the nozzles do tend to get fused and glassy. Finding them in an excavation is usually a good indication of a metal furnace, although a better one is finding the remains of the hearth itself, contaminated with traces of metal. People back then though did like to tidy up every little droplet of precious copper that they had. They look rather pot or more concertina like. These are more efficient and easier to use. Still backbreaking work though. 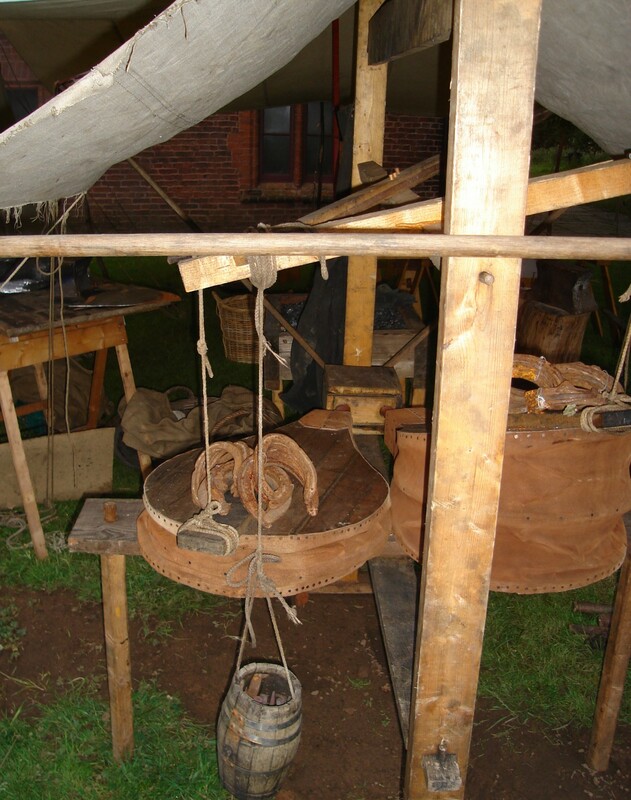 Scroll down to find photos of them in operation – essentially the leather sits as a lid on a pot, and has a hole in it which can be opened or closed, and the leather is pushed up and down. As for the Greeks and Romans, it has proven remarkably hard to locate images of Hephaestus or Vulcan, the Roman equivalent. Those I can see tend to show him with a hammer and anvil, no sign of bellows. Which is a kits shaped bag bellow, which fits later descriptions apparently. Note that the two smiths are beavering away whilst Moses is coming down from the mountain and the others are worshipping a golden calf. It looks as if one advantage of this design of bellows is that you can operate the set with one hand whilst moving things about in the charcoal with the other. Naturally there might be differences in technology between the UK and Germany, but really, given what was available and the communications of the period I think it unlikely that the UK was any more advanced in terms of bellows than Germany. The church was estimated to have been built in the late 12th to early 13th century, and the illustration clearly shows a pair of single action bellows being used to run a smith’s forge. Note two tuyeres, one from each bellows, running into it. from 1250, courtesy of the Larsdatter links page. The problem there of course is that these are just the small set of handheld bellows you use at home. But at least next time you are blowing on a fire you can think of how old the design is, over 700 years. which makes it clear that the same design as for domestic use was in industrial use by this time. You can clearly see that the illustrator has tried to draw a tiller to raise the bellows up and down alternately, but hasn’t succeeded. At least he drew the rope connecting the sticky out bits of the bellows to the pivoting piece of wood, and shows what are two rocks on top of the bellows, presumably to press them down and get a good blast of air out of them. The advantage of using two sets of bellows is obvious. Arranged the way they are, one deflates whilst the other inflates, leading to a steady stream of air through the fire. I still need to make the proper rocking setup to make using them easier, and make a good strong stand for the bellows. is distinctly rounder in shape than some earlier ones appear to be. But that was probably a matter of personal preference. Another mystery to me at the moment is when double action action bellows were invented. They are the ones you can still see in historic blacksmiths. They have two sections, a top and bottom, with a hole between and a valve in it. 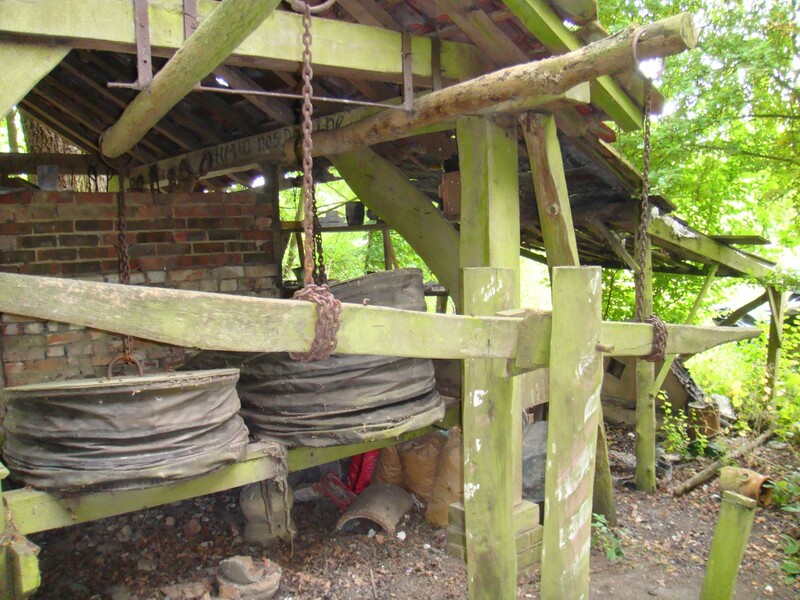 The rope pulls up the bottom, which pushes air into the top section, which is pressed down upon by a weight. The advantage of these is the constant flow of air and the fact you can pump them up more than the older type, leaving them to deliver air for long enough that you can guddle about in the fire. But no sign of double action bellows, not in Biringuccio, (1540), Ercker (1580) mentions a pair of bellows, so obviously not single one, and I don’t have any more sources for later than that. 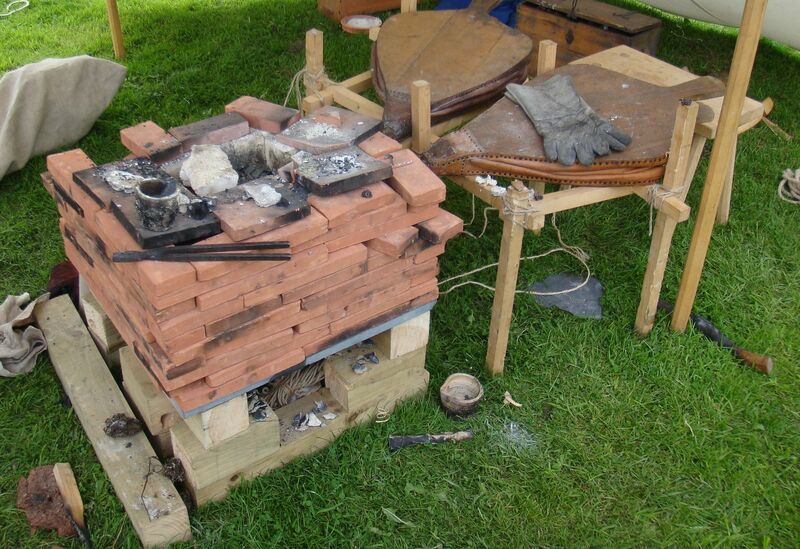 You can get instructions online to build them, and if you wanted a hand blown furnace I would make them. At the right you can see two small black air pumps powered by two 12v batteries, which deliver enough air to melt two or three hundred grams of metal in ten minutes. 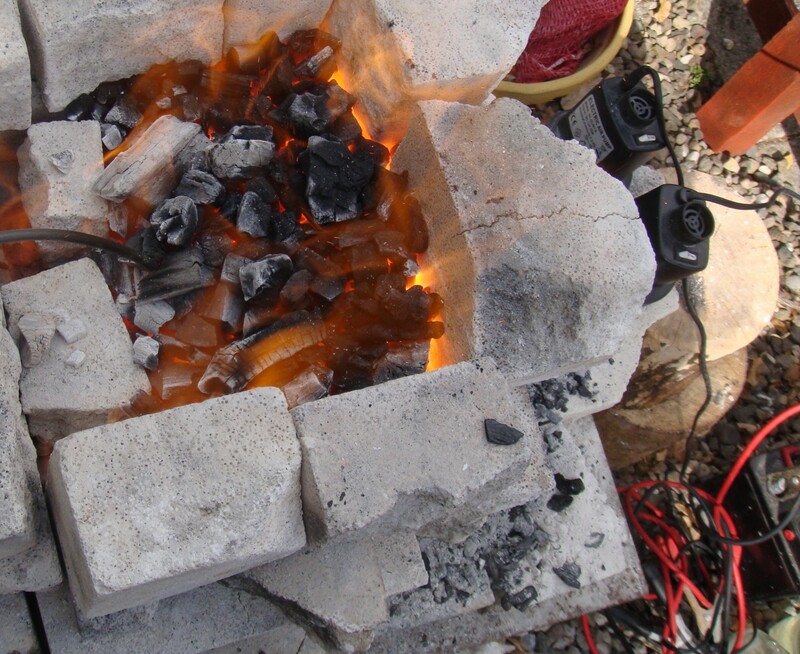 The photograph shows the furnace actually at 1100C in the hot part, but you can’t see the white hot area because the charcoal is in the way. It acts as insulation, helping keep the heat in. Another option is a hairdryer, which would move much greater volumes of air, and they are frequently recomended in books about home foundry work, the problem being they need a 240v supply and you have to be wanting to melt a lot of metal, since if you put too much air through the charcoal you won’t get the best reactions and will blow some of the heat out. The double action bellows is definitely mentioned (and described) in De Re Metallica in 1556. I’ll admit, I don’t (yet) know of any sources earlier than that, but I haven’t been looking that seriously. Unfortunatley your link doesn’t work, they don’t let you link inline. Can you be more specific about where in it? I have the Dover edition, and have no idea where you are seeing double action bellows. It is 600 pages long after all in the Dover edition. I recently recovered what I now think is a bronze bellow pipe while out metal detecting in the Scottish Borders. Bronze item poss. Bellows pipe I’d. I would be most appreciative of your opinion. the question I’d ask would be what makes you think it is a bellows pipe? I’m afraid I can’t see your post, it seems a busy forum. When I have time I’ll try and find references to the actual bellows pipe, but that might take a while. You seem like a busy chap. Is there a way to send a picture directly? I’m convinced it is a bellows pipe and possibly an early one. The shape,the narrowing to a very small outlet hole etc. It was recovered on very thin never cultivated ground over natural rock. It was sitting right on top of the stone. Close to a medieval farmstead and in direct line from a hilltop fort that has many phases of occupation.